You can get full nights of sleep now, eat like you used to, and be able to go out in public without people thinking you're crazy, cause it's finally here. It's the long awaited 3rd release from everyone's favorite Christian ska band. 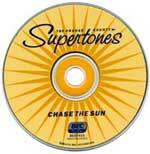 After touring with the likes of Audio Adrenaline and later, ska buddies The Insyderz and Five Iron Frenzy, The Supertones are striking back once again. The passion and bold, in-your-face lyrics return; however, this time they approach things a little differently.